I so look forward to visiting Discovery Shores, Boracay again and again. It's my home away from home. Given a choice of places to R&R (Recharge and Refresh), Discovery Shores will definitely be on top of my list. The reason for this visit was a request from the publisher of Zee Lifestyle Magazine Eva Gullas to feature Discovery Shores in their April Issue. The dynamic outgoing GM Jun Parreno, who is the genius behind the personal details that set apart the Discovery brand experience in the hospitality field, readily agreed. For starters, their motto is Service that is all Heart! This has been their battle cry for the past five years. The staff members are trained to serve always with a smile. The hydrofoil ride to Discovery Shores had an added "Parreno" touch to it-my traveling buddy, Dr. Cecile Infantado and I were served canapes and champagne by charming boat stewardess Stephanie. Cheers Jun! Upon arrival, the welcome committee were on hand with a tropical drink of pandan and lime, cold towels that were truly refreshing and two bouquets of multi colored daisies which made us feel like beauty queens. Our room had a "Welcome Home" streamer that made us feel at home right away. Our pillowcases were embroidered with our names. A bowl of our favorite fruits and native delicacies were on the coffee table. Yummy! One never gets hungry in Discovery Shores. 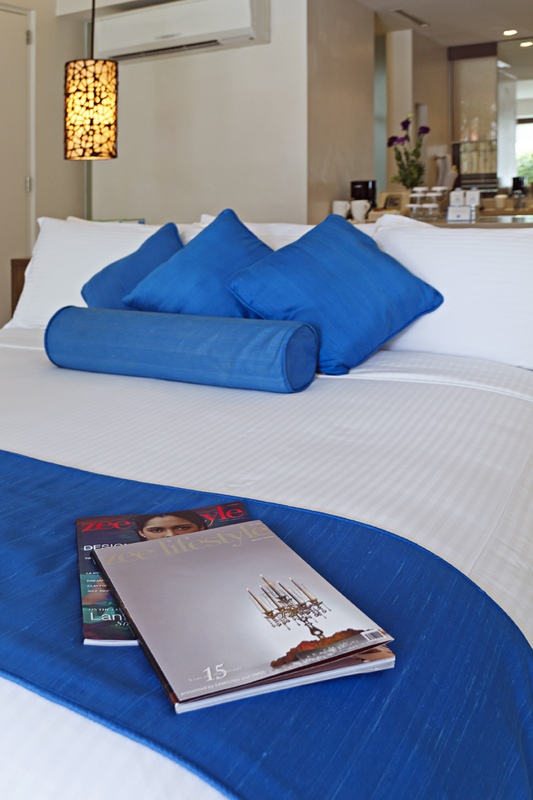 Not to be forgotten, a soothing foot massage which set off the relaxing tone of the stay. The foot massage included a foot bath with fresh flowers on the bowl. I felt pampered from the top of my head to the tips of my toes. All the amenities translate to the brand experience. The butler on the beach spoiled us daily with delicious local delicacies like turon na saging, ube maja blanca, fruit platter, wines and juices. The five course nouvelle cuisine dinner arranged by DS's excellent chefs headed by Chef du Cuisine Hadille Mata, and Chef du Partie Nathaniel Carlos on our first evening was a world class experience. It was a romantic dinner by the beach just in front of the multi awarded Indigo fine dining restaurant. How perfect could our first day be! The highlight of our second day was our Terra Spa experience. Cecil, Eva and I chose a 2-hour Terra special. It took out all the kinks and aches in my system. I felt as perfect as a new born baby! The well equipped gym was near our room so we had no excuse to skip our daily exercises. It gave us a good excuse to binge on the goodies the beach butler served us. The daily lunch buffets were deeeelicious but we chose to eat with Discovery's special people (Jun, Leeds, Belle, Joy Anne Denoga (Director of Sales and Marketing), etc.) their lunch for the day. I loved the mongo, adobo, pinakbet, guinatan calabasa with malunngay &shrimp, and fresh fish. Filipino food at its best! I always feel a gamut of emotions during departure day. I feel sad to say good bye to our hospitable and friendly DS friends but also grateful to our good Lord to have been blessed with another memorable Discovery experience. During the boat ride to the airport, Rhea and Rayniel serenaded us with a touching song to come back to Discovery Shores, Bora! What a fitting goodbye that went straight to our hearts! 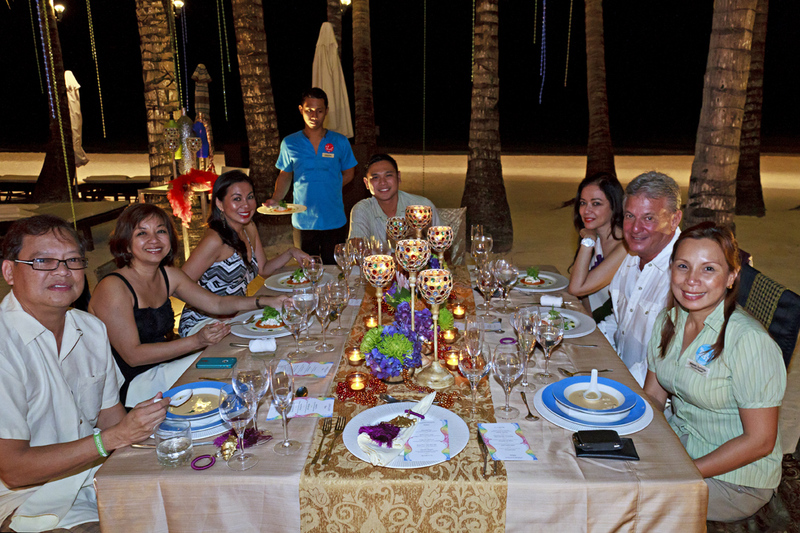 Our Zee Lifestyle Magazine group was hosted to a world class five star dinner on the beach! Jiji Gullas, Eva Gullas,(Publisher) Cecile Infantado, Leeds Trompeta, Mayenne Carmona, Richard Stoltzman and Discovery's Joy Anne Denoga are all smiles! Cheers! Cecile and I were served champagne and canapes during the short hydrofoil ride. A darling green eyed doggie guarded our room by our window. What a charming touch! Upon arrival in the hotel, we were welcomed with floral bouquets by the staff. Cold towels with orchids (staff extreme left) were refreshing after a tiring early flight. Jun Parreno, the charismatic outgoing GM, welcomed us and introduced us to young songbird (Hawak Kamay, Pagibig) Yeng Constantino and her Mommy. Belle Chen, Leeds Trompeta and Eva Gullas, enjoy a Moroccan dinner at Kasbah on our 2nd evening. Cecile, Richard and I were on the other side of the table. I just love the welcome streamer inside our room. How can we get homesick? On our trip back to the airport, we were serenaded by Rhea Vasquez and guitarist Rayniel. The song was all about going back to Discovery Shores! So touching! Our room was so cozy! 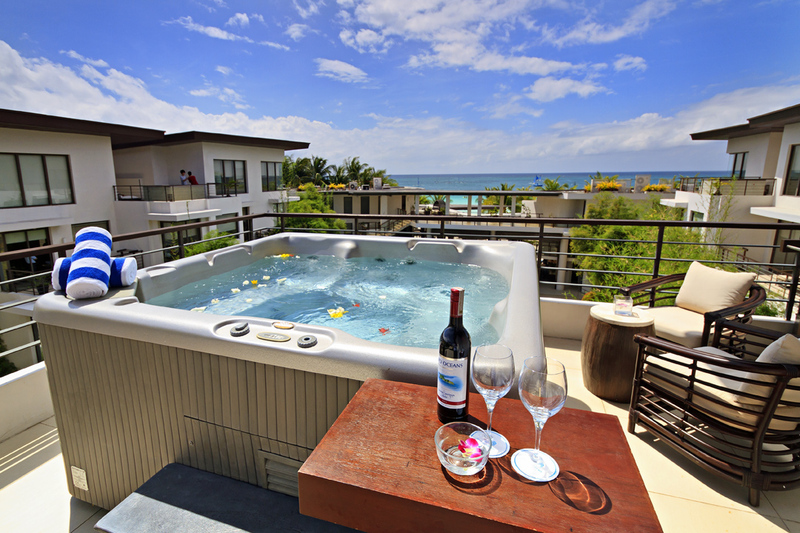 A jacuzzi overlooking the pristine beach is in a two bedroom suite. Lifestyle Asia's SILVER in RED!